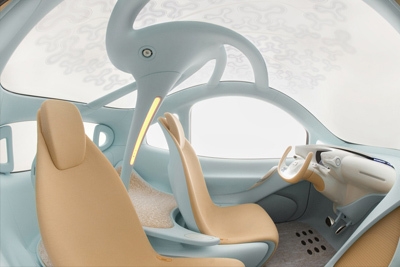 The Nissan Nuvu (new view) concept went on display at the 2008 Paris Motor Show. 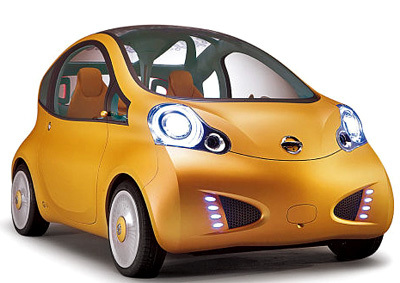 The Nuvu concept was designed to preview the next generation compact car from Nissan, as well as provide a testbed for a new, all-electric drivetrain. Powering the diminutive Nuvu is a compact rear-mounted electric motor and lithium-ion battery pack. This setup gives the Nuvu a 77 mile (125 km) range, and a 75 mph (120 km/h) top speed. Nothing spectacular, but for city use the Nuvu's performance is more than adequate. A quick charge from empty to full should take between 10 to 20 minutes while a full charge should take between three to four hours from a domestic 220v socket. To top up the battery pack the Nuvu has unusual solar panel array which is integrated into the panoramic glass roof. Across the all-glass roof are a dozen or so small solar panels. 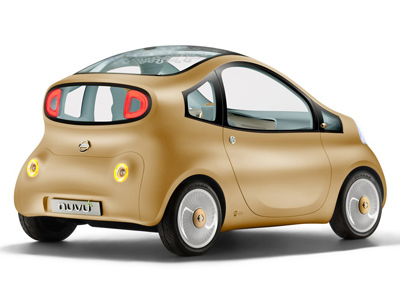 Shaped like leaves on a branch, the power they generate is fed to the battery using a 'tree trunk' within the car as a conduit. The Nissan Nuvu also uses natural, organic and recycled materials within the cabin. Inside the Nissan Nuvu are a pair of full-size seats up front and a single seat in the rear. All the major driving controls of the Nuvu concept - steering, braking, transmission and throttle  are 'By-Wire' while the steering is controlled by an aircraft-style steering yoke: with just one turn from lock to lock, the steering is very direct for agility and maneuverability in the city. Two video screens on the dashboard display the view behind the Nuvu (there are no door mirrors). These screens also act as monitors for the 'Around View Camera' which gives a bird's eye view of the car when maneuvering or parking. 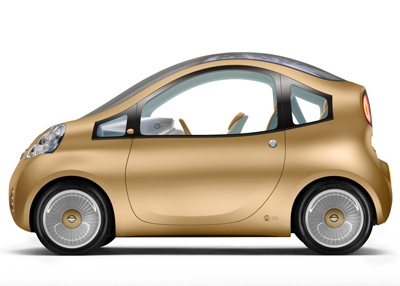 "Nuvu is literally a 'new view' at the future of the city car. It is electric, of course, but as far as Nissan is concerned, for tomorrow's city cars that is a given. No, the most important aspect of Nuvu is the interior design which provides great comfort and space in an intelligent package designed to make best use of our crowded roads and limited parking slots." Said Fran�ois Bancon, General Manager, of Nissan's Exploratory and Advance Planning Department, Product Strategy and Product Planning Division.